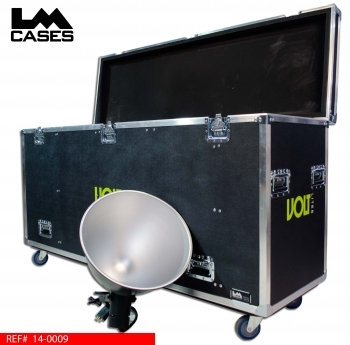 This case was designed for Volt Lites to hold 4 Altman 155 18" Scoop Lights. Each light is held in a custom Crosslink foam lined compartment that contours the bowled shape of the fixture. The foam supports the fixture at the base where the light element attaches to the bowl and at the bowl opening. The fixture is designed to be dropped into each compartment with its mounting clamp attached, the yoke and clamp are secured via a Rip Tie Velcro strap allowing the cases to be roughly handled without the yoke hitting the delicate aluminum bowl. The case interior also features an accessory compartment sized around the replacement bulb boxes allowing spare bulbs to travel with each case at all time. 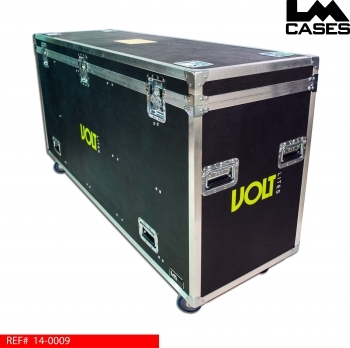 The case exterior is built out of 3/8" plywood laminated with black ABS plastic. 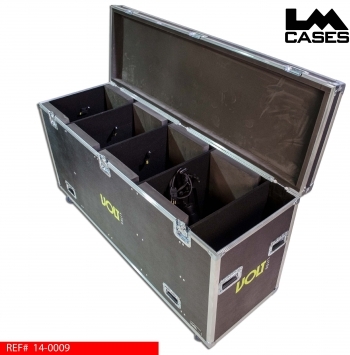 The exterior is also outfitted with 10 handles allowing the case to be handled and stacked in a multitude of configurations. The side low mounted handles allow the case to be lifted by 4 people to load into a cargo van. 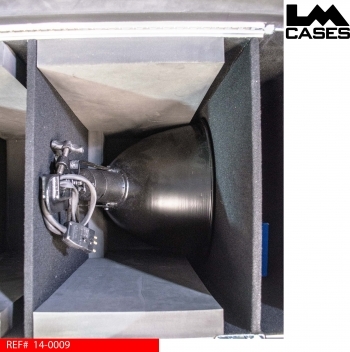 The top 4 side mounted handles are ergonomically positioned to allow easy lifting and moving for normal semi trailer applications. 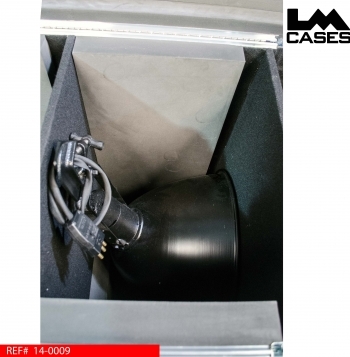 There are also 2 handles mounted in the caster pad which allow the cases to be stood up on edge and packed 4 across in a 96" wide truck, which reduces the foot print when vertical clearences allow. The case exterior also features stacking caster wells, 4" Colson casters and a custom 2 color silkscreen of the Volt Lites logo. Special thanks to Matt & Harrison at Volt Lites!